Cite page (MLA): Ward, Megan, and Adrian S. Wisnicki. "Field Diary V: An Overview." In Livingstone's Final Manuscripts (1865-1873). Megan Ward and Adrian S. Wisnicki, dirs. Livingstone Online. Adrian S. Wisnicki and Megan Ward, dirs. University of Maryland Libraries, 2018. Web. http://livingstoneonline.org/uuid/node/8e59a0ee-1450-448a-a568-c2917dfb0d91. This page introduces Field Diary V, which is part of our critical edition of Livingstone's final manuscripts (1865-73). The essay explicates this field diary's primary focus: medicine and Christian conversion, i.e., the concerns that brought Livingstone to Africa at the beginning of his career. The essay also describes the material form of the diary. In Field Diary V, Livingstone journeys from the shores of Lake Nyassa west through mountains in modern-day Malawi. Along the way, he finds plentiful food, most of it given to them by local populations. Perhaps as a result, in this diary Livingstone records far fewer instances of mutiny or struggles for authority among his men. Alphabetical Adventures of Livingstone in Africa for Boys and Girls (Iredale 1941:), detail. Copyright National Library of Scotland. Creative Commons Share-alike 2.5 UK: Scotland. These World War II-era illustrations propagate the Victorian myth of Livingstone, the outsize and iconic explorer. Livingstone initiates many conversations about Christianity, asking the people he encounters if they have heard of the "Revelation we possess" (Livingstone 1866d:). In particular, he seems interested in the spread of Christian ideas. 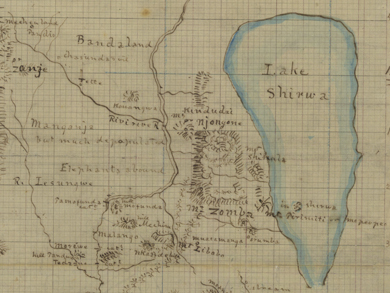 When he finds that the Manganja people have heard of "such a one who died," he surmises that "It is probable that they & the Tanganyika and Zambesi people are one" (Livingstone 1866d:). Images of two pages of Field Diary V (Livingstone 1866d:, ). Copyright David Livingstone Centre. Creative Commons Attribution-NonCommercial 3.0 Unported. The page at left (top in mobile) represents a typical page of the diary. The page at right (bottom) appears on one of the inner covers and is composed mainly in brown ink. Livingstone fuses his abolition work to his missionary zeal. When in Gwomba, a chief asks him to preach his "words of peace." Livingstone responds by talking of the Bible but also "the sin of selling his children" and a "Future state where all will be judged." Based on this, he advises the people "to expel enemies who came first as slave traders" (Livingstone 1866d:-). Similarly, he elsewhere uses the Christian rhetoric of sin to describe slaving: "the slave traders temptations are very strong" (Livingstone 1866d:). Cultural observations, too, seem bound up in these recurring concerns, as he makes notes on what he sees as the moral character of the local populations. For instance, he contrasts the Manganja, who mourn their dead, to the war-like Waiyau, who must be appeased with by giving up village members to them (Livingstone 1866d:, ). Manganja are "more civil" but fewer in number than "dominant" Waiuyau, who have guns to the Manganjas' bows and arrows (Livingstone 1866d:). In addition, there are notes about local crops, Africans' dress and appearance, and animals. Images of two pages of Field Diary V (Livingstone 1866d:, ). Copyright David Livingstone Centre. Creative Commons Attribution-NonCommercial 3.0 Unported. The page at left (top in mobile) contains illustrations that Livingstone first made in pencil, then inked over. The page at right (bottom) includes the remnants of a plant that has been pressed onto the page plus prominent staining that appears to be due to a source other than the plant. This diary is the same kind of book as the previous field diaries. Like the first two, it includes a frontispiece note from the late 1940s-early 1950s by Rev. James McNair, who writes that there is "no very close correspondence between these notes and the Last Journ[als]" (Livingstone 1866d:). The first page entry is in black ink, but the majority of the diary is in grey pencil, with occasional over-inking in black or additions in orange pencil. As with the previous diaries, Livingstone writes from both ends of the diary at once, meeting on page  with an entry from 22 October 1866. In this way, each small book continues to function both as a detailed record for the future and as more immediate notation of mileage, temperature, payment, and vocabulary.